A scientist works on the lasers of Fermilab's Holometer experiment, which is designed to look for hypothesized tiny jiggles that may be inherent to space-time. An ongoing experiment could reveal whether or not our full and fleshed-out 3D universe is an illusion, a 2D projection onto a cosmic screen beyond our perception or understanding. 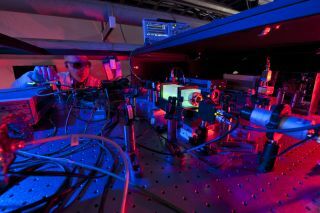 The Holometer project, which is based at the U.S. Department of Energy's Fermi National Accelerator Laboratory (Fermilab) in Illinois, is now operating at full power, probing the very nature of space-time itself. The Holometer — short for "holographic interferometer" — splits two laser beams, sending them down perpendicular 131-foot-long (40 meters) arms. A system of mirrors then bounces the light back to the beam splitter, where it recombines. Motion causes brightness fluctuations in this recombined light. Holometer scientists are analyzing such fluctuations for anything exotic or unexpected — an effect caused by something different than ordinary ground vibration, for example. The Holometer experiment at Fermilab in Illinois sends laser light through a beam splitter, then down two perpendicular 131-foot arms. Mirrors then bounce the light back to the beam splitter, where it recombines. Scientists analyze fluctuations in this recombined light, looking for tiny jiggles that may be inherent to space-time itself. Specifically, the team is looking for evidence of "holographic noise" — a postulated quantum uncertainty inherent to space-time that would make it jiggle, just as matter continues to move as quantum waves even when cooled to absolute zero. These jiggles would be very slight, likely corresponding to a velocity of about 1 millimeter per year, researchers said. That's about 10 times slower than continental drift. The experiment is basically gauging the universe's information-storage capacity, searching for signs that locations and time aren't precisely defined, researchers said. For example, all the information in the universe may actually be contained in limited two-dimensional packets, just as images on a TV screen are constructed from numerous 2D pixels. "If we find a noise we can't get rid of, we might be detecting something fundamental about nature — a noise that is intrinsic to space-time," said Holometer lead scientist and project manager Aaron Chou, a Fermilab physicist. "It's an exciting moment for physics. A positive result will open a whole new avenue of questioning about how space works."